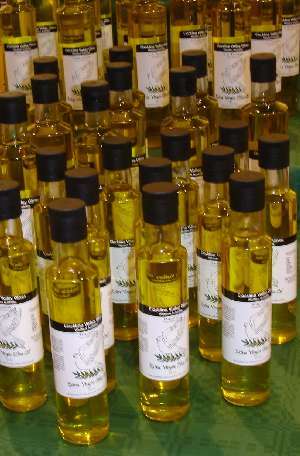 Clackline Valley Olives produce a premium range of Extra Virgin Olive Oils. Our oil reflects the granite sub-soils of the district, displaying a fine gold colour, an aroma of fresh fruit, and a rich taste. Olive oil is made from the crushing and then subsequent pressing of olives. The fact that olives are rich in oil is reflected in the botanical name of the olive tree - Olea europea - since the word "oleum" means oil in Latin. Extra virgin olive oil is derived from the first pressing of the olives and has the most delicate flavour and most antioxidant benefits. It is among the healthiest of foods available on earth. A great deal of information is available about the benefits of using olive oil, but rather than repeat it here it might be best for you to look at other internet resources, such as The Worlds Healthiest Foods. After careful maintenance of the olive grove, our olive oil products are all hand harvested. The oil is naturally settled on our property in a specially designed cool storage cellar and handling facility before bottling and sale to the public. There is a regular price structure, and an order form, and we often have special prices for selected products. Please contact us for your particular needs. We also display at Shopping Centres and at field days and shows throughout the Wheatbelt with tasting and sales available. Contact us for information on our current location. For cellar-door sales, please contact us for availability. Our cellar is not always manned, but we will make every effort to be there when you want to come and visit us.